Thor #364, Marvel Comics, cover-dated February 1986. "Thor Croaks," written and drawn by Walter Simonson. 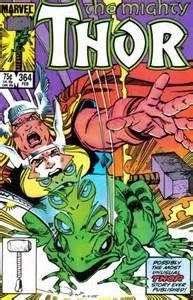 Thor has been turned into a frog. No, really, a frog. How did this happen? Is the God of Thunder really fighting rats in Central Park? Is that George RR Martin playing a flute in the sewers of New York City? And who will become the leader of Asgard in Thor's absence? Listen to the episode and find out! ﻿﻿﻿﻿Next Episode: Doctor Strange Sorcerer Supreme #34, Marvel Comics, cover-dated October 1991. It's the Valentine's Day episode! In this lovefest, Professor Alan and Emily talk about superhero relationships and marriages. Superman & Lois (or Lana or Lori Lemaris or Wonder Woman), Spidey & MJ, the Dibnys, Batman and Selena (or Talia), Sue Storm and her options .. we talk about it all. The song used in this episode was "About Love," by The Choir, from their 1990 album "Circle Slide." 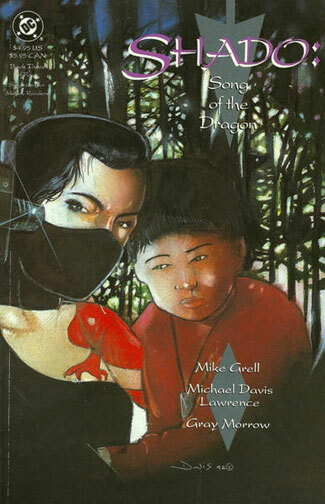 Shado: Song of the Dragon, Book Three, DC Comics, cover-dated March 1992. "A Force of Dragons," by Mike Grell,with art by Michael Davis Lawrence and Gray Morrow. The Yakuza helicopters have landed at the monastery, to take out our little band of over-matched survivors. What chance do a Viet Nam burnout, a past-his-prime Korea vet and a mother and child have against the best assassins that the Japanese mob can find? And what trauma is that Viet Nam vet trying to escape from anyway? And did that one guy really just chop off that other guy's finger? Listen to the episode and find out! ﻿﻿﻿﻿Next Episode: Thor #364, Marvel Comics, cover-dated February 1986.